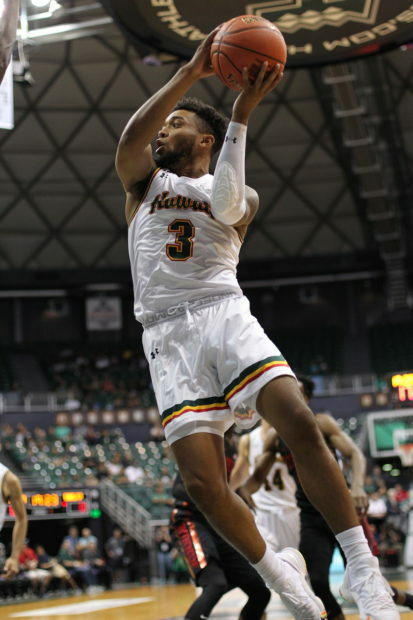 If Long Beach State wants to continue its current streak this Thursday, that would be just fine with the University of Hawai’i basketball team. 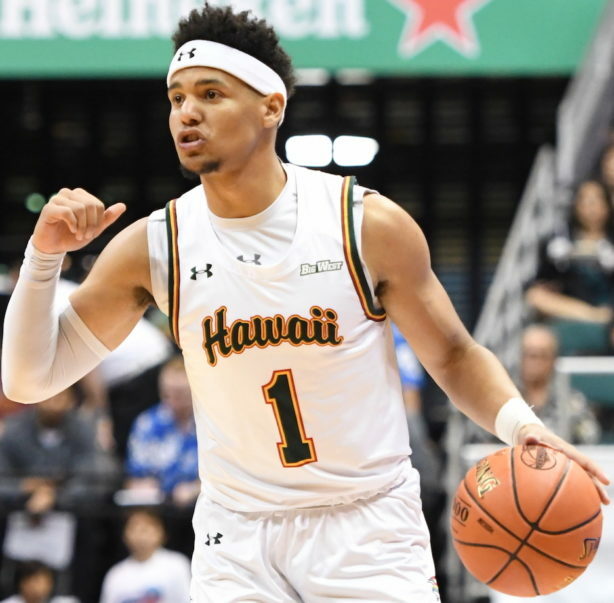 The Rainbow Warriors will host the 49ers in a Big West Conference game at the Stan Sheriff Center on Thursday at 7:00 p.m. Hawai’i is 12-7 overall and 3-2 in the conference; Long Beach is 8-13 and 2-3. The 49ers have lost three straight, while surrendering an average of 86.7 points per game and allowing opponents to shoot 50 percent from the field in those losses. However, the 49ers also own an 80-70 victory at UC Irvine on January 16. 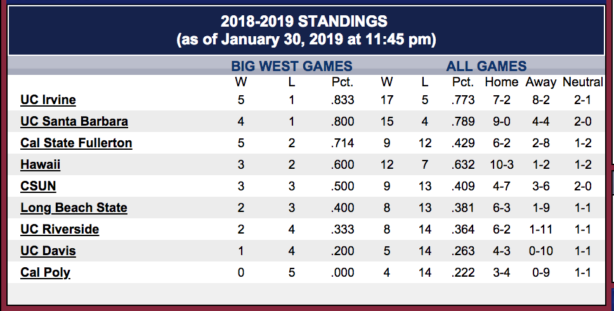 UC Irvine is 5-1 and in first place in the Big West. The Warriors split a pair of home games last week, falling in overtime to UC Irvine, 75-74, then rebounding with a resounding 80-60 win over UC Davis. The forward tandem of 6-9 senior Jack Purchase and 6-8 junior Zigmars Raimo have been leading the Warriors in recent weeks. Purchase is averaging 15.4 points and 6.4 rebounds per game against Big West teams, and is also shooting 43.3 percent (15 for 33) from 3-point range over those five games. Raimo is averaging 11.6 points and a team-high 6.6 rebounds per game, and he leads the Big West in field goal percentage at .578. Last season, he scored 17 points and grabbed four rebounds in a breakthrough performance during UH’s 74-63 home win over Long Beach State. Junior guard Eddie Stansberry has struggled with his shooting in recent weeks, but he continues to lead the Warriors in overall scoring at 12.6 points per game. He also ranks second in the Big West for 3-pointers made with 55 (Purchase is fifth in the conference with 47). Sophomore point guard Drew Buggs leads the conference in assists with 5.7 per game, and he is also averaging 8.9 points and 4.5 rebounds per game. Senior guards Brocke Stepteau (9.0 points, 2.8 assists) and Sheriff Drammeh (8.5 points, 3.3 rebounds) are also key contributors. Seven-foot freshman center Dawson Carper had a breakout performance of his own last week, tallying 13 points and five rebounds in the win over UC Davis. Long Beach State, despite its recent defensive deficiencies, remains a threat with the presence of Deishuan Booker. The 6-3 senior guard is averaging 27.6 points, 5.0 assists and 3.6 rebounds per game against Big West opponents so far. Making it more impressive, he is shooting 54.3 percent from the field in those five games, and is also 55 for 62 from the free throw line (.887). Booker is averaging 17.6 points per game overall for the season, and ranks third in NCAA Division I with 140 made free throws. He leads the Big West in free throw percentage (.886) and steals (35). Yussuf has been a source of concern for Hawai’i in previous years. In his last five games against the Warriors, Yussuf averaged 14.0 points and 6.0 rebounds per game, and shot 27 for 34 (.794) from the field. Other 49ers to watch for include 6-5 senior guard Bryan Alberts (10.5 points per game, team-high 46 3-pointers), 6-7 senior forward KJ Byers (8.1 points, 5.9 rebounds), and 6-2 sophomore guard Edon Maxhuni (8.0 points per game, 35 3-pointers, .467 3-point percentage). Since joining the Big West in the 2012-13 season, Hawai’i has a 6-9 record against Long Beach State, including 4-2 in games played in the Stan Sheriff Center. Coca-Cola is the sponsor of Thursday’s “Retro Night” game. The UH players will wear retro jerseys inspired from the 1993-94 squad that advanced to the NCAA Tournament. 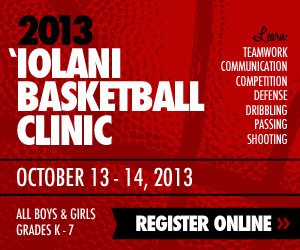 Fans are encouraged to wear their retro Hawaii gear. Fans can also register to participate in the Coca-Cola halftime contest at Gate A for the chance to win a grilling set.